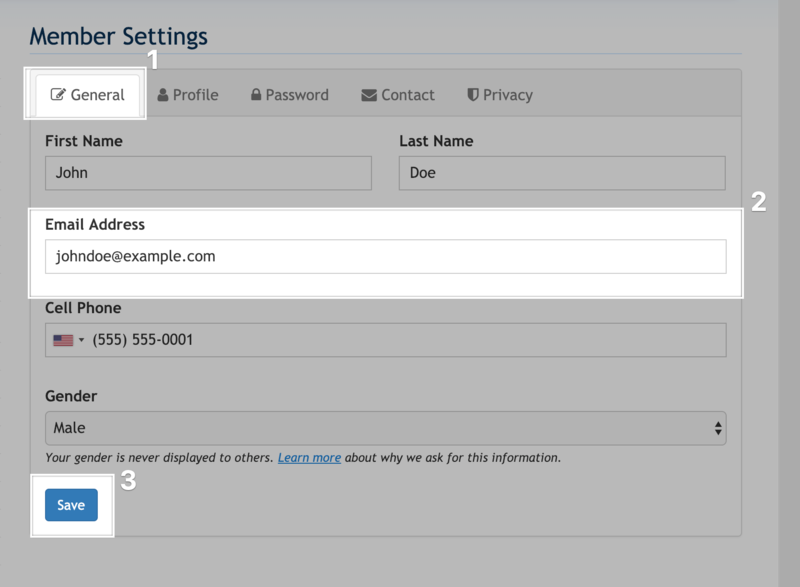 How to update the email address on your member profile. Making sure the email address on a member profile is correct and up-to-date is important for ensuring the member is able to log into the website and can receive any communications sent. If a member's email address needs to be updated, they can make this change at any time. Who can update an email address? For security purposes, admins cannot update a member's email address (learn why here). Therefore, the member will need to log in and follow the instructions below to update this information. First, log into the website and click on your name in the upper-right-hand corner. From the drop-down menu, select "Member settings." In here, go to the "General" tab. Under the "Email Address" field, you can update this information. Once finished, click on the "Save" button.